The late Peter Bernstein liked to say that despite what we may think, we don’t know what will happen in the future. We believe that those extrapolating from the recent past to call for the demise of the hedge fund industry are probably a bit extreme. Our contention is that the last seven years may prove one of many periods when lean times are followed by fat ones. Buffett’s case implies that the market should win by approximately the amount of fees paid to the hedge fund and fund of funds managers. However, after seven years of live action, the lead taken by the S&P 500 is substantially more than the difference in fees would suggest. “Fund of Funds” is the composite return of the five hedge fund of funds selected by Protégé Partners, LLC (“Protégé”) for the Bet. Returns reflect actual results of the fund of funds in the Bet from 2008–2013 and estimated results for 2014. Management fees are estimated as 1.5% of net assets per annum for hedge funds and 1.0% of net assets per annum for fund of funds. Incentive fees are estimated as 20% of gains per annum for hedge funds and 5% of gains per annum for fund of funds, both subject to a high-water mark. Furthermore, the first year of the Bet, 2008, heavily favored hedge funds, so the “something else” was even more pronounced thereafter. Over the last six years, the S&P 500 returned 159%, in comparison to the 57% return of the fund of funds. 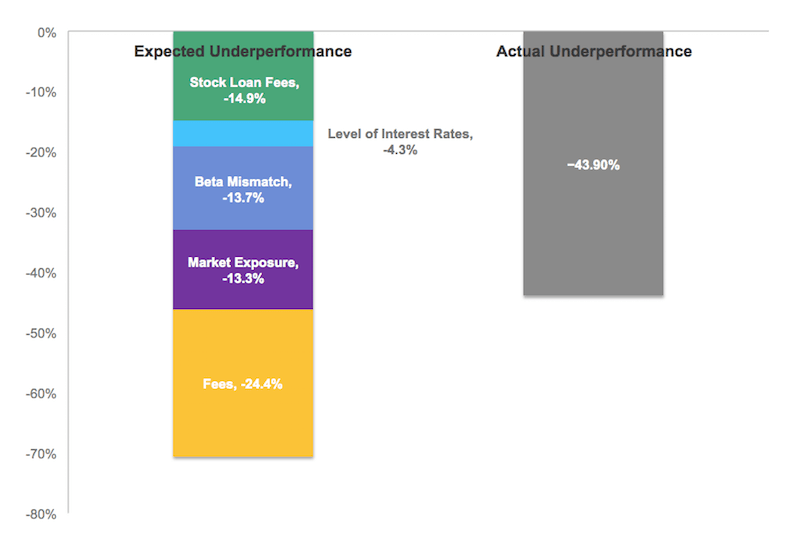 Using our estimates, fees subtracted 22% cumulatively from returns over those six years, accounting for only 21% of the performance shortfall in this stretch. Over the vast majority of the Bet’s duration, 79% of the outcome has been determined by something other than fees. So much for the 80/20 rule! The “something else” can be discovered when breaking down the components of a hedge fund’s return. 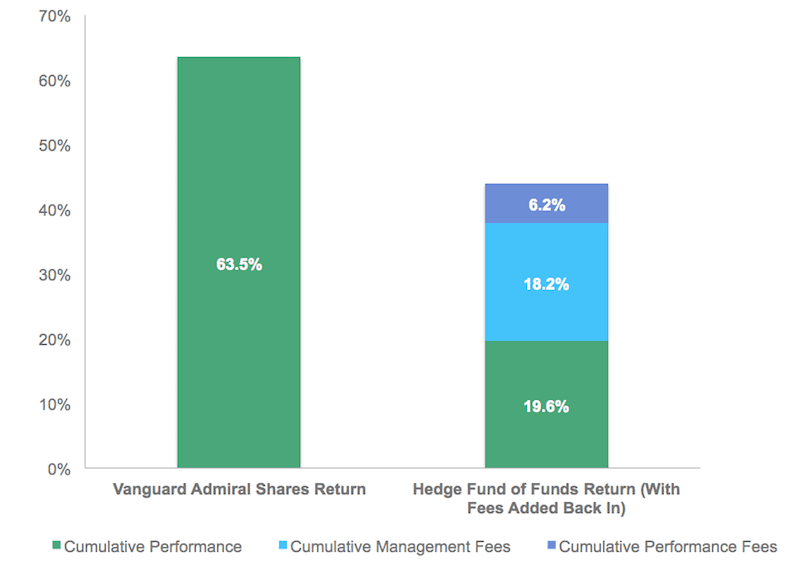 Stated simply, the return earned by a hedge fund is a function of the beta embedded in the strategy, the return on cash balances, the alpha from security selection, and the fees and expenses incurred along the way. We believe the headwinds faced by hedge funds have resulted from a combination of the substantial outperformance of the S&P 500 over global equity markets and the adverse impact of the Fed’s Zero Interest Rate Policy (ZIRP) on hedge funds relative to other investment vehicles. Together, these factors wreaked havoc on a bet, the prospects of which we initially felt quite confident about. As we intend to show, the residual performance after adjusting for the impact of this investment environment manifests a return stream that could have been beneficial to a diversified portfolio of risk assets under different circumstances. The lower market exposure and lack of risk-adjustment in the Bet did not concern us at the time of its launch. Back in 2007, we believed the high valuation of the S&P 500 relative to history did not augur well for Buffett’s benchmark selection. Putting numbers behind our contention, money manager GMO predicted at the time that the S&P 500 would return −1.1% real (approximately +0.6% nominal) per annum over the subsequent seven years.4 According to their estimates, history would suggest that the 7.3% annual gain of the S&P 500 since stood only a 15% chance of occurring. Over this period, we believe the cost for hedge fund managers to borrow stock rose significantly due primarily to low interest rates and secondarily to increased transparency and more competition in the stock loan market. When a manager shorts a stock, the security is borrowed from the beneficial owner, such as an index fund, through a middleman, a Wall Street bank’s prime brokerage division. The beneficial owner, in turn, receives cash collateral for the stock, pays interest to the borrower on the cash, and reinvests the proceeds at a higher rate to earn a spread. At the launch of the Bet, we split and pre-funded the proceeds that would eventually go to the victor’s charity of choice. We decided at the time that having more than $1 million in 10 years would be wonderful for the charity, but having less would be unpalatable. As a result, we placed the present value of $1 million in a zero-coupon bond with the intention of letting it sit and mature 10 years hence. As a starting point, our outlook for traditional stocks and bonds is far from rosy. Bonds generated a 10.9% annual return over the last six years, leaving the 10-year Treasury below 2.0% today.10 It’s hard to imagine a repeat of that performance over the next stretch. Long bull markets tilt the investment debate in favor of the autopilot approach . . . it’s at that moment that everybody says, “Why do I need a manager?” . . . If you go back and look at 2000 and 2007, there were strong calls for indexing, and the data looked very pro-indexing at those moments . . . And everybody completely forgot about that when active managers beat the market on the way down. As far as hedge funds are concerned, we think structural characteristics are moving in favor of investors. First, fees are coming down. In response to a period of challenging returns, the industry is in the midst of a wave of innovation geared towards offering the attributes of hedge fund allocations at a lower cost. Second, as the US economy appears on stronger footing and QE comes to an end, interest rates may rise in the ensuing years. In a “normal” environment, hedge fund returns will increase due to higher interest rates on cash balances and short rebate proceeds. Third, although global diversification has hindered returns over the last seven years, the same outcome may not occur in the next seven. If we are in an environment today where we aren’t sure whether stocks are very overvalued or whether they have been repriced to give a lower, but still fair, return, taking equity risk in a fashion that has less duration looks like a pretty good idea . . . The strategies that most fit the bill are the very “hedge fund-y” strategies that have so disappointed investors in recent years . . . if you can find a way to do it more cheaply (or you can actually find some managers talented enough to pay for their fees), we believe now is a pretty good time to be on the look-out for shorter-duration ways to take standard risks. If the Bet continues on its current course, there’s always the next 10 years. We happen to know firsthand that Warren couldn’t be more excited to watch that period unfold. 1. Geographic headwind calculation: S&P 500 return (+7.3%) minus the MSCI ACWI return (+2.7%) = 4.6%, multiplied by the 50% net equity exposure in hedge fund portfolios = 2.3%. 2. Small cap tailwind calculation: S&P 500 return (+7.3%) minus the Russell 2000 (+8.2%) = −0.9%, multiplied by 50% net exposure = −0.45%. 3. 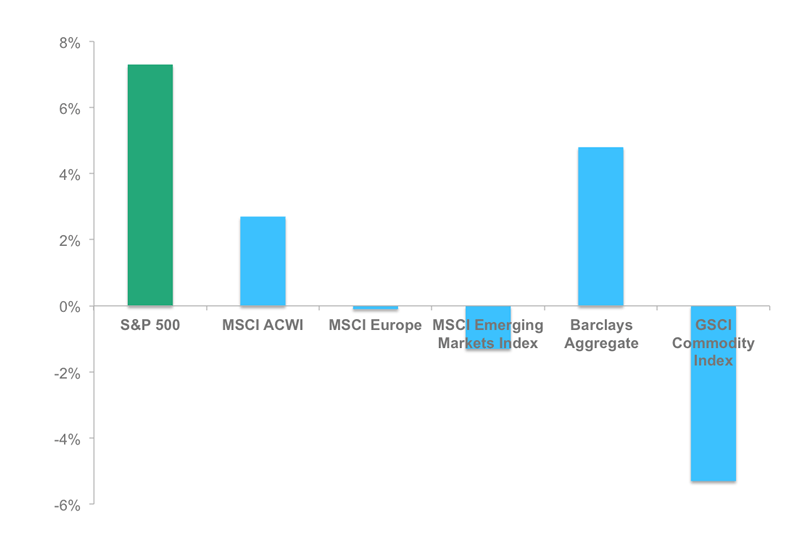 Market exposure calculation: MSCI ACWI return (+2.7%) * 50% net exposure = 1.35%. 4. GMO Seven Year Forecast (January 2008). 5. If an average hedge fund runs 80% long/40% short, it will hold uninvested cash of 20% (100 − 80%). Additionally, it will hold 40% of NAV in cash from short rebates, the impact of which is omitted in this calculation and later incorporated in the Stock Loan section. Strategies like global macro and commodity trading advisors have minimal need to post collateral and generally hold close to 100% of NAV in cash. 6. The average 3-month Treasury bill yield 1994–2014 was 2.8%. Source: Bloomberg. Annual returns calculated are compounded in estimating the cumulative impact for the seven year period. 7. Most of the money that beneficial owners earn in stock loan emanates from “special” issues, typically highly shorted stocks in high demand. In a higher-rate environment, lenders can earn returns on “general collateral” as well, but with short-term interest rates at 0%, lenders cannot make money on general collateral. 8. Hedge funds typically pay a net rate to prime brokers. The net rate is the difference between the interest received on their cash collateral and the borrowing cost for the stock. Before 2008, an average hedge fund paid a net annual rate of −3% (paid to play) and today a typical hedge fund pays a net annual rate of +2% (pays to play) to execute the same trades. Data received from the underlying data of two large hedge funds and confirmed in conversations with Goldman Sachs, Morgan Stanley and BAML Prime Brokerage groups. 9. Actually, our intent was to make a bet within the Bet and split the investment of collateral half in BRK stock and half in our flagship Protégé Partners, LP fund. Unfortunately, the Long Bets Foundation was not a Qualified Purchaser and could not invest in Protégé Partners, LP, so we elected to put all the proceeds in Berkshire stock. 10. Barclays US Aggregate Index. Source: Bloomberg. 11. Grant’s Interest Rate Observer, 14 November 2014, page 1–2. This article reads like a rather long winded apology for losing a bet to Buffet. Gambling with other people’s money, taking fees that are in the domain of greed rather than profit, and then failing to perform — that’s all so normal and expected for “risk funds”. Buffet won a million? Is that news? Thanks for putting together such a thoughtful, carefully documented analysis. It’s really excellent. With great respect, though, I think the story for hedge fund managers is much worse than you acknowledge. As for the future, you point out big, big two secular problems. First, regarding short-selling, “the growth of the hedge fund industry has created more competition for desirable stock to short,” making short positions more expensive. More importantly—and this is likely true of all active investment, not just short-selling—“when markets were opaque, middlemen and borrowers had asymmetric information about prices and took advantage of less-informed” investors (not just lenders), but the opacity that managers depended upon has shriveled. Neither of those is a cyclical phenomenon, so both suggest that the risk-adjusted net total returns of hedge funds are likely to be worse in the future (relative to passive portfolios) than they have been in the past. Unfortunately, the days of outperformance by hedge fund managers already seem to have been in the past even before you took on The Bet seven years ago. In fact, 2007 was the same year that Naik, Ramadorai & Stromqvist (http://intranet.sbs.ox.ac.uk/tarun_ramadorai/TarunPapers/CapacityConstraints_October2006.pdf) reported that hedge fund “alpha generation occurred primarily during the peak of the bull market period between October 1998 and March 2000” but that “alpha in the hedge fund industry has severely declined in the most recent sub-period in the data, from April 2000 to December 2004. They concluded that “capacity constraints (too much capital) do exist at the level of hedge fund strategies, and are likely to be a concern for investors going forward.” That sounds like a much better prediction, circa 2007, than your own. The biggest problem for the hedge fund industry, in my mind, is simply that it represents an extremely high-cost way of achieving something that has always been easy to do at extremely low cost. When hedge funds are at their best, what do they accomplish? The answer is this: low beta relative to the equities market, and low returns that are nevertheless good on a risk-adjusted basis. But that is what bonds have always provided. The CEM Benchmarking study (sponsored by my employer, NAREIT, and available at https://www.reit.com/investing/industry-data-research/research/cem-benchmarking-defined-benefit-pension-fund-research) bears this out using data on actual investment results for more than 300 U.S. pension plans over the period 1998-2011 (much longer than The Bet): hedge funds were the second-worst performing asset class at 6.02% per year even before investment costs, and their extraordinarily high investment costs (125.1 bps/yr) made them the absolute WORST asset class with net returns of just 4.77% per year—lower than all four fixed income categories, which had investment costs ranging from just 17.3 to 42.0 bps/yr. Again, thanks for doing this excellent analysis. Thanks for the kind words Brad. I agree that competition and the cost of stock borrow will be secularly more expensive than they were historically and that hedge funds do cost a lot more than passive strategies. I don’t agree that anyone has or should have foresight in market timing or economic conditions, or that the success of hedge funds (and particularly long-short equity funds) is dependent on that. The Bet attempted to pit fees against security selection, and given what ensued over the last six years, the environment really hasn’t made the comparison apples-to-apples. Not sure if what I put together is an excuse or a rationalization, but it’s definitely the past. What happens going forward is what matters now. Fair enough, Ted. You’re right, the fees-versus-selection question certainly didn’t get a fair hearing. With a flair that would make a three-card monte player blush, Mr. Seides somehow takes apart, makes a few “adjustments” and then reassembles the pieces of his bet and finds… a tie! If only we all could have Mr. Seides’s magic wand of “adjusting for the impact of this investing environment” to clean up what are politely called massive screwups, and less politely known in more colorful terms. My goodness, it’s as if a mediocre baseball player undertook to show you how his singles and doubles should actually be home runs (if you just made adjustments for wind currents, curvatures of stadiums, an unprecedented number of talented pitchers) and, as a result, ties him with Barry Bonds’s home-run record. And then, just to show you there are no hard feelings, let’s you know that it’s not worth quibbling over messy past calculations, since what matters is next year! Time to play ball! Mr. Seides’ likes to remind us that no one can know the future, just in case you may have thought that the highly compensated “best and brightest” he knows do have some crystal ball. He then runs through several items that seemed so unusual and could never be accounted for in advance — zero-bound interest rates, S&P 500 outperforming global markets, added costs in shorting stocks, etc. Yes, the world is messy and chaotic, and hits us with unprecedented events. Is that news to anyone? Should that be a surprise? As Mr. Seides should appreciate, the future ain’t what it used to be. Unpredicted outcomes and events are not a free pass to adjust returns, massage numbers, and claim you’re just smoothing out the curve. One thing we do know (with all due respect, Mr. Seides) is that the next seven years will hit us with massive, unanticipated events, some of which may make the past seven years look mild by comparison. The next several years could have regional wars, natural resource shortages, massive cybersecurity breakdowns, and who knows what else. Does that allow anyone then to make a similar claim as Mr. Seides and insist that these singular events once more mitigate any incorrect assumptions? I have a suspicion that one sure thing over the coming decade will be hedge fund managers telling us why their fund performance is not nearly as poor as you think once they “adjust for the impact of this investment environment.” Plus ca change. Eloquent and articulate assessment of a loquacious sophistry. Clearly the pride of the “best and the brightest” is stinging at being on the short end of this bet. That’s the problem with so many of the so-called intelligensia – they often don’t see the forest for the trees. p.s. the use of intelligensia (sic) is an attempt at humor. Just before the intelligentsia rush in, half-cocked. At the risk of piling on (ah heck, why not), readers may want to take a look at Mike Santoli’s column from yesterday on Mr. Seides’s argument: http://msantoli.tumblr.com/post/110804679383/cry-me-a-river-that-leads-to-omaha. When a seasoned, respected, straight shooter like Santoli tells you it’s a “tortured” defense and mocks the rambling eight-page letter, it may be time to call this one. In retrospect, Mr. Seides may conclude that public explanations are not his forte, no matter how many charts, graphs, and calculations you squeeze in. Game, set and match to Robert Jones. It is almost uncomfortable to read the feeble defense the hedge fund apologists are pawning in public forums these days. The investment consulting industry bought into the hedge fund/alt investing theme hook, line and sinker about a decade ago and in return have done more damage to pension funds and high net worth portfolios than can be imagined. To the contrary, it can easily be argued that “under the microscope,” hedge funds are worse than they appear. The yawning gap between market returns and hedge fund returns represents a lost opportunity cost to their investors. Pension funds across the country are struggling to meet their liabilities while paying exorbitant fees for underperformance. This model is unsustainable. Why there is still significant money in these vehicles is beyond comprehension – perhaps other than with a handful of outperforming managers that deserve it. Calpers finally “got it” and you would think many more will see that the “emperor has no clothes” despite the attempts by their consultants and alt managers to obscure the view. It did not take a genius to discern that U.S. stocks were bargains in 2010 at 10 PEs and low valuations. Yet inexplicably, most hedge funds and consultants were counseling their institutional clients to seek investments that were “non-correlated” with the U.S. stock market. What a colossal mistake! The hedgies got stuck looking in their rear view mirrors (2008) and were so caught up trying to smooth volatility and protect for the tail risks that had already occurred, that they somehow didn’t notice that stocks were a screaming buy. It seems to me that if investors are willing to pay a king’s ransom in fees to a money manager, they should expect the manager to be intelligent enough to identify undervalued assets that offer above average appreciation over the long term. The vast majority of hedge fund managers have failed in that regard and not only have they terribly underperformed, they have effectively pickpocketed their investors. With apologies to Winston Churchill……….Never before in the field of money management has so much been confiscated from so many to benefit so few. Great comment on the hedge fund attribution over the last several years, and especially explaining details of the risk-adjusted/beta-adjusted performance of the hedge funds. Would have been helpful to provide some background of the hedge funds used to compare vs. S&P 500 TR. This entire article is ludicrous in its entirety. Most is intellectually damaging, some is grotesque in its mathematical absurdity. I really can’t remember seeing anything that is so wrong in its assumption, premise and mathematics in my experience. I spent a couple decades on the other side of securities lending and this leaves me speechless (well, obviously not entirely). Maybe I’m missing something. Desperation in the Hamptons I would guess. The CFA Institute should be ashamed that they facilitated the publishing of this. It exemplifies all the worst aspects of explaining away performance shortfalls. This, from the organization that gave us the overly rigid GIPS? If there weren’t opportunities to comment on the original article and engage in active discussion, I would certainly agree with you. That happens way, way too much in the investment world, but this is different: Ted Seides has engaged actively with the many critics (including myself) who think the progress of “The Bet” is simply additional confirmation that hedge funds have proven to be a poor way to invest, and are likely never (or at least never again) to provide the risk-adjusted returns or diversification benefits that unsuspecting investors have been led to believe they will. And when that conclusion becomes clear to everybody, it will also become clear to everybody that hedge fund fees are unconscionable. This is hardly the worst article published by CFA Institute, and I definitely applaud the back-and-forth. What will it take for all the pension funds within the corporate and public sectors to wake up and smell the coffee? As dutiful taxpayers, shouldn’t we at least have the right to tell the public pension funds to stop investing our money in these high-cost, under-performing hedge funds and instead invest that money in simple low-cost index funds? Seems to me that the pension fund managers and the hedge funds (as well as with the mutual funds & private equity funds) are a bit too chummy with each other. This is understandable as many pension fund managers used to work at hedge/mutual/private equity funds and vice versa, but it is an obvious conflict of interest that is doing a great disservice to the general public. Having pension funds invest in low-cost index funds of domestic/foreign equities and bonds would seem like a cheaper way to generate returns, especially considering how “the Bet” has shown that hedge funds rarely outperform, especially once you net their costly fees. I returned to this post and comment section when I came across news that our dear, good friend Ted Seides has apparently departed his hedge fund and now, as he puts it on his profile, is a “free agent.” Alas, we will miss his rationalizations for hedge fund failures and his insights into why the “best and brightest” end up at places like his old firm. We can only hope that someone else at his prior firm will take up the torch and charge into the breach with a panoply of charts and graphs and obfuscating text to justify disastrous under-performance year after year. Those lucky devils who get this “free agent” next.